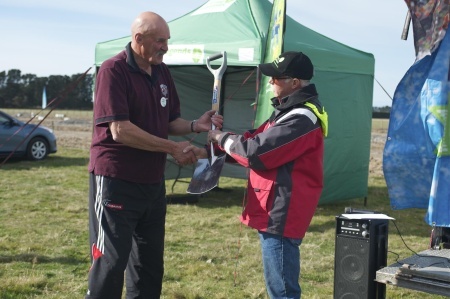 Mid-Canterbury’s Jock Ross joined local volunteers to plant nearly 7,000 native trees at Harris Scientific Reserve – a kanuka sanctuary which protects one of the last stands of dry-land kanuka in Canterbury. The 2.5ha paddock and its surrounding natural and undisturbed dry-land kanuka stand was purchased by the Ashburton District Council along with an adjoining 8ha paddock to the east. Forest and Bird were granted a “license to occupy” by the council on condition a trust was set up to manage the site. The total area of 10.5ha is now managed by the Ashburton Community Conservation Trust. The Trust has already planted the 2.5ha area within the natural kanuka border. The Harris Scientific Reserve has only been preserved through the willingness of the past landowner, Arthur Harris, and the efforts of the Ashburton Community Conservation Trust. Living Legends was keen to assist in the extension and restoration of this remnant because of its great scientific value and the commitment of the local community. A total of nearly 7,000 dry-land kanuka and associated species have been established by Living Legends and the maintenance of these plantings will now be handed back over to the Ashburton Community Conservation Trust. There’s no doubt that rugby is in the blood in the Ross family. His son Isaac Ross played for the Crusaders, Chiefs and Highlanders in Super Rugby and also for the All Blacks, wife Christine played for the Black Ferns and his three other sons have also both played provincial rugby and have represented the New Zealand Army while on overseas deployments. He’s very proud of the family’s rugby achievements, particularly that grass-roots rugby is still so strong in New Zealand, with son Isaac, and himself both becoming All Blacks from a minor rugby union. At more than 2m tall, Jock Ross was one of the tallest All Black forwards of all time. Playing in the era before lifting in the lineouts, he used his impressive frame to win a lot of ball. 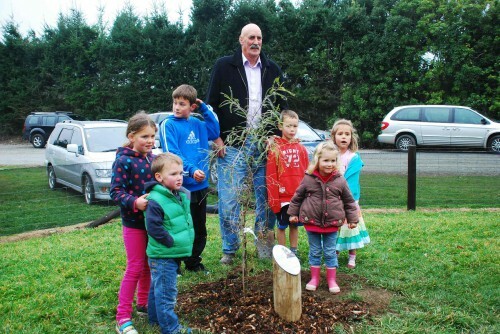 Jock Ross and Devon McLean at the 2011 Living Legends planting day. Photo courtesy of Ashburton Online. Jock played a record 161 matches for Mid Canterbury between 1970 and 1987. He also represented the Hanan Shield XV in three matches, including against the British Lions in Timaru. He represented the South Island in 1979, 81 and 82 and also played 16 matches for Canterbury in 1980. In 1981, at age 32, the All Black call up came for the end-of-year tour of France and Jock won praise for his line-out prowess in the five All Black matches he played. He has remained active in rugby since his playing days ended by coaching and he also became involved as a television presenter on the programmes devoted to the second and third divisions. Jock also spends a good chunk of his time with his family, helping run the family transport business, farming and is kept busy with his 14 grandchildren. Jock says the best piece of advice he ever received was to work hard to achieve his maximum potential in whatever he chose to do. When asked what he would now pass on to young people Jock says “take every opportunity to participate in the sport of your choice while you are young. It is often character building and involves discipline both of which are important going forward in life, particularly if your sport is a team sport”.